Combines Arylate fiber features of lightness, flexibility, and shock absorption with the Carbon fiber features of high elasticity and minimal dissipation of energy. 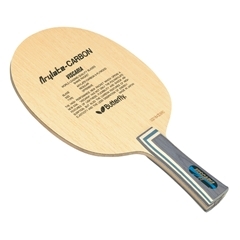 Butterfly's only hybrid Carbon/Arylate shakehand blade. Combines the Arylate features of lightness, flexibility and shock absorption (less vibration) with the Carbon features of high elasticity and minimal dissipation of energy. Koto outer plies, Balsa center ply. Viscaria's compact head size makes it ideal for quick re-looping right off the bounce.